A few days ago while looking out the kitchen window I saw not one but three brilliantly colored bluebirds! It is not the normal time of the year for them to visit our yard, so perhaps they were immigrating south for the winter. Bluebird In Autumn, (c) 2011 Joni Beach. 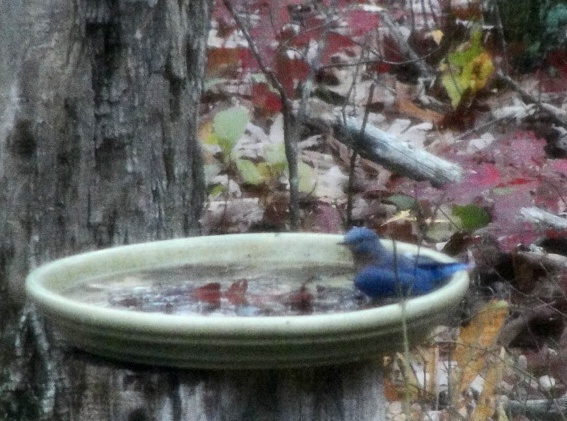 By the time I retrieved my camera only one bluebird was still there…guess he needed a bath before continuing his trip! What color inspiration for a creation of art!…What life inspiration for a day of encouragement. Seeing the 3 bluebirds was a great surprise on a day that I needed it! Indeed, Joni, I find there IS no greater encouragement for me than similar serendipitous sightings in nature! Thank you, thank you, thank you for sharing! You’re welcome…and I think I can see why they are sometimes called “the bluebirds of happiness”! Gorgeous! I’ve never seen bluebirds in my yard. I so miss the hummingbirds, however, as they left in mid October. We do have a family of blue jays that come every morning for peanuts. We’ve not had many either…hummingbirds are really neat to watch for sure. While a bit noisy at times, I love the color and personality of the blue jays too! Blue jays are what I’ve commonly seen too. Maybe bluebirds are seen more often in the mountains?–I’m not sure. And, you’re welcome!